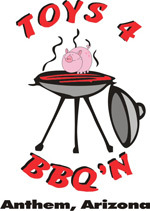 Bio: Toys 4 BBQ’N is a family team based in Anthem, Arizona. The team is comprised of the husband and wife duo of David and Karyn, with the greatly appreciated assistance from our two boys Ryan (10) and Zachary (7). To us, BBQ is a family event.